The main purpose of preserving food is to prevent rot, which can be done a number of ways. Storage methods can aid in extending the shelf-life of preserved food, and also keep it away from insects and hungry animals and rodents. Different methods of food preservation can retain or destroy nutrients, and use more or less resources to process. When possible, use the method that retains most nutrients and use the least amount of wood fuel. Root vegetables are already in the ground as they grow, so one effective way of preserving some varieties through the winter is to keep them in the ground. Mulch by covering with straw or leaves, tagging the spots where the plants are by driving a stick into the ground and writing on it what plant is waiting. This method is suitable for horseradish, parsnips, radishes, leeks and turnips (not suitable for beets, carrots or potatoes). Harvesting is difficult in frozen ground so is best done before and after deep winter freezing. Root cellars are cool and dark, two conditions which help maintain fresh foods fresh, and extend the shelf-life of preserved foods. Cold storage is simply the condition in a root cellar but applies to other structures that can be built for these purposes. Cold storage and root cellars are best for onions, beets, green tomatoes, potatoes, winter squash, pumpkins, turnips, carrots, celery, apples and other crunchy fruit. Vegetables and fruits should not be stored together, since apples and pears give off ethylene gas which shortens shelf-life of vegetables, and fruits can absorb the strong odours of certain vegetables. Do not allow fruits and vegetables to freeze. Cold storage can be built as outdoor pits, above ground insulated structures, or as root cellars in existing buildings with uninsulated stone or concrete basements. Below are these options and how to build them. In an uninsulated basement, wall of an area with a northern wall. The thermal mass of the earth and the colder north-wall outside temperatures will help keep the root cellar optimally cold. A window or screened ventilation pipe will be needed to vent stale air and allow cooler air into the cellar. Place slats under wooden crates stored on the floor to allow for air circulation and prevent rot of stored vegetables. When a basement is not available, as in the case of apartment buildings or other circumstances, use old chest freezers and refrigerators outdoors, on balconies, etc. Drill a ventilation hole at a top corner and cover with screen mesh to keep out pests. In-ground cold storage can simply be an old refrigerator or chest freezer buried in the ground, or a garbage can. But in severe climates, the storage containers should be insulated from above with hay bales or at least 1 foot of loose snow. 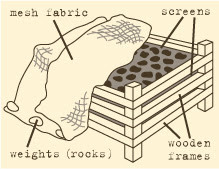 Pile your produce into a mound on the ground over a layer of hay, and cover the sides with a thick layer of insulation and boards or other protective barriers as the outer layer. Make sure the top is capped to prevent moisture draining in, and allow for a vent, screened to keep out pests. Building a hay-bale shack is quick and easy. Stack bales tightly in a rectangle leaving a center for storing food. Cover with a large board and top the board with more hay-bales to insulate. Regular inspection of pests is necessary with these above-ground storage designs. Build the iceless refrigerator large enough to meet your food storage requirements. To build the refrigeration basket, start by loosely the basket with the jute cloth. Sew the jute cloth around the rim of the basket. The lower end of the cloth must hang loosely around the bottom, exceeding the length of the basket. Arrange four or five bricks or stones in a circle. Place the metal or clay tray on top. Place three to five stones (or bricks broken in half) in a circle inside the tray. Place the jute-covered basket on top of the stones in the tray. basket loose-fitting lid Fill the tray with water, making sure that the loose ends of the jute cloth dip into the water. To use the basket, place perishable food in the basket, cover the basket with the loose-fitting woven lid, and then cover the lid with a wet jute cloth. Dampen the jute material on the top and sides periodically with clean water. The water will evapourate from the cloth, keeping the contents cool and fresh (temperature depends on environment). Place basket in a breezy, shaded area. Canning is best for tomatoes, green beans, leafy greens, roasted peppers, large fruits, berries, syrups and fruit juices, as well as cooked foods like beans, stews, soups, meats, fish, fruit butters and applesauce. Pickling is best for cucumbers and cabbage but also good for eggs and mushrooms, cauliflower, green beans, beets, garlic, peppers, okra and leafy greens. Canning is a high-heat processing method of preserving foods. There are 2 ways to pack the produce into jars: raw (raw packed) or cooked (hot packed). To hot pack most fruits or vegetables, steam them or heat to boiling in juice, water or syrup, then immediately pack them into the jars. For raw packing, load clean produce tightly into jars and pour on boiling water, juice or syrup. Wipe the rim and sealing ring to remove any particles of food, then close the jar and proceed with the canning process: boiling water bath for fruits and high acid vegetables, and pressure canning for low acid vegetables. The lids will be slightly concave if the canning processing was successful – if not, begin processing from the start or store a defective batch in a cold place to consume within one to two weeks. Store jars in a cool, dark place and be sure to date and label all jars. Vegetables and fruit must be washed and cut, (peeled and pitted if applicable); berries can be left whole. The amount of time needed to can depends on the produce being canned, and the method of canning. See chart of processing times below. Fill a large pot halfway with hot water, load jars in a metal (canning) basket and put inside. Add boiling water to 2 inches above the jars (do not pour directly onto jars). Cover, bring to a rolling boil and begin timing. Add more boiling water as needed if level begins to drop due to evaporation. When processing time is up, immediately remove each jar individually with tongs. Check that lids are tight, and cool with space between the jars. For this process a pressure cooker is needed, and pressure canning is the only safe method of preserving low acid vegetables by canning. Place a round cooking rack at the bottom of the pressure cooker. Pour in 2 to 3 inches of boiling water. Place jars on the rack making sure jars don’t touch sides or each other. Fasten the pressure cooker lid and make sure heat is high. Once steaming begins, time 10 minutes. By then the first inch of the steam jet should be nearly invisible, now close the vent. At 8 pound pressure let the heat die down slightly. When the pressure reaches 10 pounds, begin timing. Hold this pressure for the full canning period, it is imperative that the pressure never fall below 10 pounds while canning for the time allotted. If at any time the pressure falls below 10 pounds, begin the process over again from the beginning. When time is up, remove the pressure cooker from the heat and let cool. When pressure is zero, open the vent, then the lid. Remove the jars and let cool leaving spaces between the jars. Tighten lids if necessary. The following processing times are for quart jars. Pickling preserves vegetables using vinegar and salt for vegetables or sugar for fruit. Without sugar available only vegetables can be pickled, but for long-term storage they also need to be boiled in a water bath once canned (see Canning above). Prepare a brine mixing 1/2 gallon of water and 1/3 cup of salt. Clean and scrub vegetables thoroughly and be sure the containers and utensils are impeccably clean as well. Soak 4 pounds of vegetables overnight in brine solution, then drain and pack into 1-quart jars. Divide whole garlic cloves and heads of dill among the jars, adding 2 teaspoons of mustard seeds in each one. In a pot, mix together 1 1/2 cups of vinegar, 3 tablespoons of salt and 3 cups of water and bring to a boil. Pour boiling hot mixture over the cucumbers and fill to 1/2 inch from the top of the jars. Cover with lids and process closed jars in boiling water for 20 minutes. Cool thoroughly with several inches between each jar. Bot, the toxin that causes botulism, can develop in canned foods and is so lethal that even a touch of the affected food to your lips can be deadly. Luckily, it is easily destroyed with heat. Before opening any canned food, boil the entire unopened jar for 15 minutes. Drying is the most nutrient-damaging method of preserving foods, but can add diversity to food supply and flavours, such as with dried fruits, sun dried tomatoes, dried herbs. 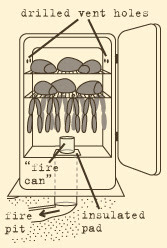 Smoking applies to meats only and although it has been found that smoke in foods is a likely carcinogen, it is an effective and tasty way of preserving food for indefinite lengths of time. with cheesecloth or screen to keep pests off, without letting the coverings touch the produce. These can be stacked vertically. Solar driers retain more vitamins in the produce, but require more time and materials to build them. These must lay flat and cannot be stacked vertically. Curing retards spoilage by drawing water out of meat using salt, which also kills microorganisms. Two methods exist for curing meats: dry-curing and brine-curing. Brine-curing requires the use of sodium nitrites and nitrates to prevent spoilage, which are not only difficult to obtain but also carcinogens. Dry-cured meats store well but will be tough and dry, in which case honey can be added for flavour and keep the meat moist. After curing meats they need to get smoked (see below). To dry-cure meat, rub a mixture of salt and seasoning (including sugar, honey, spices, herbs) directly onto the meat, rubbing well and pressing extra salt and seasoning into grooves, on cut ends, and around protruding bones. 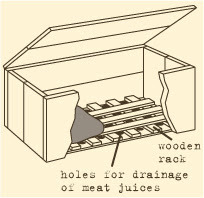 Cover the bottom of a curing box (see below) with a thick layer of curing mixture and place the pieces of meat on top. Pack more mix on and between the pieces of meat, making sure each piece is well covered, especially where pieces touch. Continue layering with meat until the final piece is packed and coated. Cover the box and let sit for 3 days, then remove the pieces of meat and recoat any surfaces that are not well-coated. Check and re-cover the pieces every 5 days henceforth. a long chimney) helps preserve meats for great lengths of time, and adds much flavour to the preserved meat. Always burn hardwood for smoking, as the resins in softwood will ruin the meats. A smoke chamber holds the meats as smoke enters the chamber from a fire pit 10 feet away through an underground tunnel (chimney). A high source of fat and calcium, milk from cows, goats and sheep can be consumed after a quick boil but will not keep for more than a day in the summertime (though can be frozen in winter as long as temperatures stay cold). To have dairy accessible for consumption throughout the year, it needs to be preserved in the form of yogurt (consume within 1 week), butter (keeps several months), or cheese (lasts from 2 weeks up to several years). Milk spoils quickly without refrigeration, but with friendly bacteria milk can be turned to yogurt which will keep for several days. To make yogurt, heat a quart of whole milk to 150F without boiling. Cool down to 105F and add 2 tablespoons of existing yogurt and mix well. Cover and keep in a warm place or wrapped in thick towels until thickened, about 24 to 48 hours. Keep cold. In warm or hot weather, butter will not keep without refrigeration, therefore butter will need to be clarified for it to last several months. In cold weather, keep fresh butter in a cool place, or freeze in an outdoor cellar. To make 1 pound of butter, about a gallon of cream will be required. Cow’s milk separates easily into cream, simply pour milk into a tall container in a cool location for 24 to 48 hours to allow the cream to float to the top. Place the cream in a large jar, close tightly and churn by rolling it around on the floor or shaking it for about half an hour. When the cream has separated into butter and buttermilk, drain the buttermilk into a separate container through a strainer to catch pieces of butter. (Save the buttermilk for cooking, baking, or using in cheese making.) Rinse the butter a few times with clean cold water until the rinse runs clear. Mix about 3/4 ounce of salt per pound to help reserve the butter. Knead the butter by gathering it into a ball, then pressing it out into a thin layer, repeating until all the water is worked out and salt is worked in. Store in a cold or cool place. To keep for 1 month without refrigeration, immerse in a salt water brine containing enough water to float an egg. For longer preservation, clarify by simmering the finished butter (salting not essential) on a low heat for 30 minutes, avoiding browning, smoking or burning. Skim off the scum as it forms, and when the butter looks totally clear, strain through several layers of clean cheesecloth into a scalded jar. (Scalding kills bacteria which would spoil the clarified butter). Store in a cool place. Cleanliness, accurate temperature control and lots of milk are required for successful cheese making. Keep all utensils scrupulously clean and avoid contaminating with dirty fingers, washing hands each time before handling the curd. Never use aluminum or cast iron materials, choose stainless steel or enamel pots and wooden utensils. 1 pound of semi-hard cheese will require about 5 quarts of milk, but for best results make a 3 pound ball using 12 to 15 quarts of whole milk. Add 1 cup of buttermilk to 4 quarts of milk. Let sit at room temperature for 24 hours. Add the quart to 15 gallons of milk (raw or pasteurized) that has been warmed to 86F. Let ripen for 1 to 2 hours. To pasteurize milk, heat to 145F and hold for 30 minutes to, then cool rapidly to 86F. Keep milk at 86F and rennet: eight 1-inch squares for 15 gallons of milk. Stir thoroughly, then cover and hold at 86F for 30 minutes until milk curdles. If the curd has the consistency of yogurt, it is not done yet. Using a long clean knife, cut all the way through the curd in a crisscross pattern spaced about 1/2 inch apart. Cut the curd horizontally into 1/2 inch cubes, sticking your clean or gloved hand in the curd to do this. Stir the curd gently for a few minutes, then slowly heat to 102F. Stir constantly to avoid burning the bottom. It should take 30 to 60 minutes to reach 102F. During this time, a yellowish liquid (whey) will start separating from the curds. Hold at 102F for about half an hour until the curds reach a desired firmness. Text by squeezing and quickly releasing a handful of curds – if they are elastic and tend not to stick together, they are done. Place cheesecloth over a large colander and pour the curds into the colander. Save the whey for bread, animals or composting. Once the curds are well drained, sprinkle with 2 tablespoons of salt and mix well. Tie the ends of the cheese cloth together to make a bag and place in a cheese press (see below). Press for about half an hour under light weights (10-15 lbs), then increase to heavy weights (40-60lbs) and press for 16 to 20 hours. Remove the cheesecloth and bandage the cheese with a clean dry cloth. Set in a cool dry place and turn it every day as it dries, until it forms a hard rind. If it shows signs of molding, rub with butter and cut the mold away before waxing. Wrap your cheese in one or two layers of clean cheesecloth. Melt 1 to 2 pounds of wax to almost boiling, and brush or dip the wheel in the wax. Keep the wheel in a cool dry place while it cures. Turn every few days to discourage molding, and wash the shelf to keep it clean and free of mold. Cure for 6 weeks for a mild flavour, or 4 to 6 months for sharp cheese. If the cheese starts to swell, that indicates a bad bacteria invaded the cheese and has ruined the wheel. Rennet is a curding agent that is the salt extract of a suckling calf (a calf, pig or lamb that has eaten no grass or solid food, only mother’s milk). Rennet comes from the abomasum, the 4th and largest stomach in the calf. Remove the abomasum, wash thoroughly, salt it, cut it into strips and dry out as in making jerky. Store in a dry container until needed. To make cheese with calf rennet, cut off 1-inch squares, adding 2 squares to every gallon of milk. Cut a flat board into two 1x1” squares. Clamp the squares together and drill pilot holes centered 1 inch from the sides of each corner, then separate the boards and enlarge the pilot holes to 3/4 inch in one board and 1/2 inch in the other. Cut a 1/2 inch dowel into four 10-inch lengths and glue them into each of the 1/2 inch holes. Slip the other board (with the 3/4 inch holes) over the dowels to hold them in position while the glue dries. Use sterilized 10- or 15-lb and 40- or 60-lb dumbbell weights (boiled for 10 minutes) wrapped in cloth as weights. Vinegar has a variety of uses, including preserving foods and also cleaning. To make apple cider vinegar, the first step is to make cider and the second is to turn it into vinegar. Collect a variety of apples, tart and sweet, fallen or hanging, but avoid wormy, molded or rotting apples. Crabapples work as well but should be less than 1/4 of the total apples. Wash thoroughly and remove stems, leaves and the end of the blossom (bottom button of the apple). Chop the apples and grind them to as fine a pulp as possible, using a food mill or rolling pin. This may require a few passes, and save any juices to add to the cider. The pulp is called pomade. The pomace must now be pressed to extract the cider. 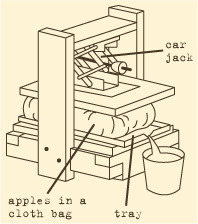 Scoop the pomace in a clean white pillowcase and place in a cider press (see below). Going slowly, apply a bit of pressure until juice starts to flow, wait for it to stop, then apply more pressure. Filter all the cider through several layers of cheesecloth to clarify it and improve storage quality. Store into clean glass bottles or jars with non-metal lids. Clean all equipment and materials thoroughly before and after use. Cider is ready to drink at this point, but to make vinegar follow as below. Using a car jack multiplies muscle power in this press. Because of the force that will be applied, it’s important to make the frame strong. Build a platform slightly larger than a large tray that will be used to collect the juice. This tray should fit the pillowcase and have an opening for the juice to drip out of. Bolt 2x8s on either side of the platform, and a top for the car jack to press up against. Ideally the car jack would be bolted to the top as well as to a flat board that will press down on the pomace, but you can also assemble the setup each time. Open a bottle or jar of cider and let stand at about 20oC. After about 5 weeks it will turn to hard cider, then to vinegar. When a cloudy clump of bacteria forms on the surface of the vinegar, carefully skim this off and save for making more cider. This bacteria is called “mother” and if mixed in to fresh cider will speed up the vinegar-making process to about 2 weeks instead of 6. Oils are valuable for use in cooking and food preservation as well as for making soaps and detergents. They can be extracted from a variety of nuts and seeds including sesame, safflower, sunflower, canola, apricot kernel, pumpkin seed and walnut. Sunflowers are a good choice because of the high yield of seeds and relative ease of plant maintenance, requiring little care. They have a soft shell and high oil content, the all black seeds being much better than the striped seeds. Good sunflower seeds can have the shell cracked with the fingers, and the seed inside should fill the shell completely. Hard, striped shells and small seeds yield little oil. Dry thoroughly before bagging and storing for making oil. Damp seeds will feel humid and possibly warm when you bury your hand in it. Seeds that are damp can be dried in the sun by spreading out the seeds thinly on plastic. In the evening, pile the seed up to keep it from absorbing moisture in the cool night air, and spread out again in the morning. After two or more sunny days, the husks will be dry. Now bag the seed and store for a week. In that time, the moisture in the seed will be drawn into the dry husk, and the entire seed will become evenly dry. Discard all moldy seeds. Remove the husks and separate the seeds from the chaff (all waste can be composted or added to livestock feed). Clean the seeds making sure it has no fine dust, chaff bits, dirt, sand or stones. Winnowing is an easy way to clean the seeds: on a day when there is a steady breeze, spread a cloth on the ground and drop the seeds from a container to the cloth. The chaff and dirt will blow away, but stones must be picked out by hand. Warm or hot seeds yield the most oil. To warm the seeds, choose a sunny day and lay black plastic on the ground, spreading the seeds thinly on the sheet, and cover with a sheet of clear plastic. When a handful of seeds is uncomfortably hot (around 150F) the seeds are ready. Oils can be extracted with an oil press, an expeller, or large mortar and pestle. If a Komet oil expresser or Taby press is available this will speed the process. The simplest manual method is to make a “butter” by mashing the nuts or seeds to a smooth, fine pulp using a mortar and pestle, transferring to a container and waiting for the oil to naturally separate and rise to the surface. Pour off this oil and store in a clean jar in a cool, dark place. The fibrous meal left behind after extracting oil is called seed cake and is an excellent additive to animal feed. Pack and store carefully to prevent rancidity. Sesame seed cake is the only meal suitable for human consumption as well. If using an oil press or expeller, clarifying is an extra step that removes contaminants from the pressed oil such as fine pulp, water or resins. After collecting the oil into containers, allow to stand undisturbed for a few days, then remove the clear upper layer. If it needs further clarification, filter the oil through a fine filter cloth. Before packing the oil you can heat it to drive off traces of water and destroy any bacteria. To pack, use clean dry containers, such as sealed glass or plastic bottles. Coloured containers in a dark box help increase shelf life, which is around 6 to 12 months if properly packaged and kept away from heat and sunlight. To make flour you will need to locate a grain mill or grinder that clamps onto a tabletop. Any cured grain can be milled into flour, including rye, wheat, corn, rice, barley and oats, as well as soybeans, chestnuts, peanuts, lentils and dried peas. Corn is the hardest of all grains to grind, but making sure all grains are thoroughly dry will help. Most grinders are adjustable for “fine” or “coarse” grinding. “Grits” are made by cracking grain on a coarser setting (sifting will separate find grind from the grits). Grits are cooked in water or milk and are highly nutritious. Finder grinds produce “cake” flour to about 50% more volume than the whole grain. Fresh ground flour does not have a long shelf-life due to the natural oils present which go rancid. Freezing is the only way to save flour for longer periods but winter cold fluctuates and is not a reliable way to preserve it. Best is to grind only as much flour as is needed for no more than one week. Store small quantities in a glass jar, and larger quantities in metal or plastic cans with fitted lids. Many kinds of breads can be made without the use of yeast or sourdoughs, including chapatis, pancakes, rotis, injera, scones, biscuits, tortillas, muffins and lefses. Yeast is a dormant plant with millions of cells that grow and multiply when placed in warm water and is fed sugar and flour. The carbon dioxide byproduct is what makes dough rise. It is best to make bread in a bakery where wild yeasts in the air can mix with dough to help leavening. Sourdough is a fermented flour mixture that also produces gasses which help dough rise, and is a health food. To make yeast, mix together 1 cup of cooked mashed potato, 1/4 cup of sugar, 2 teaspoons of salt and 1 cup of warm water (105F to 115F). Pour into a 1-quart glass jar, cover with a cloth and leave in a warm place (80F to 85F) for two days until mixture ferments and bubbles up. One cup of this yeast is needed to make 1 loaf of bread. As each cupful is subtracted, replenish this yeast starter by stirring in 3/4 cup of flour and 3/4 cup warm potato water, water or milk, allowing another day to ferment. Keep cool and use 1 cup per week, replenishing as described. Making sourdough requires catching wild yeasts in the air, which may or may not occur and can yield unpredictable results, from flat, moldy, bad smelling bread, to leavened and tasty bread. Making bread in a bakery will raise the odds of catching wild yeasts. A milk and water sourdough starter combines 1 cup unpasteurized milk with 1 cup of flour. Cover with a light cloth and keep in a warm place for two days until mixture ferments. Keep alive as for yeast (above) or dry out and store for up to 5 months, mixing with 1 cup lukewarm water, 1/2 cup of flour and 1 teaspoon of sugar. Let stand in a warm place until it foams, then it’s ready to use. Rennet also comes from vegetable sources (ie stinging nettle rennet - 6c. of very strong nettle tea combined with 4c. uniodized salt) including nettle, lemon or common sorrel, fumitory, unripe fig sap or giant purple thistle. This info coes from the 10th edition of 'The Encyclopedia of Country Living' by Carla Emery ... it's huge and filled with all sorts of 'forgotten' information. This blog is the most informative I have been able to find so far. I recently befriended someone that is a Shelf reliance consultant. I had never heard of the company or even the concept but she gave me a shelf reliance coupon and now I am in the process of starting to fill up my pantry. The only problem I came across was to actually buy. Thank you so much for solving my problem for me. I bookmarked your blog and will be a frequent visitor. This is what I'm looking for! Very informative. These procedure is really applicable and useful to a mom like me. And I'm sure to all who really enjoys storing food or preserving special delicacies. And to make sure these foods will last, proper storage is also a very important thing to consider. These are some great and useful tips on food storage and preservation techniques. Currently, we are just taking things for granted. We are not well-prepared should an unforeseen circumstance like a virus pandemic or a war were to hit us and we are forced to stay confined to our homes for a few months or more. We need to be more ready should an unwanted scenario like those happen to us. Correct food storage methods will ensure we get sufficient food supply in desperate times when no external resources are easily available. The main purpose of preserving food is to prevent rot, which can be done a number of ways.